Click through the slidshow to see how the Miami Marine Stadium has changed over the last 50 years. Here, boats are being lowered into the basin for a race in the 1960s. Original Miami Marine Stadium event posters from the 1960s for the Champion Spark Plug Regatta and the Sea Circus. Miami Marine Stadium upon completion and before landscaping, 1963. The stadium was used for more than boat races. It also held concerts, religious ceremonies, protests and much more. Pictured is a philharmonic concert at the stadium in the 1970s. Today the stadium is covered in graffiti and a popular spot for skateboarders and parkour athletes. The Miami Marine Stadium has been through several incarnations over the past five decades, and the latest is the subject of a new exhibit at the Coral Gables Museum. Concrete Paradise: Miami Marine Stadium, opening Oct. 17, traces the building’s distinctive history, from its early days as a speed boat racing venue to today as a giant, graffiti canvas and parkour playground. The city originally built the stadium for speed boat racing, which curator Rosa Lowinger says was the sport Miami was known for long before the Miami Heat’s Three Kings. 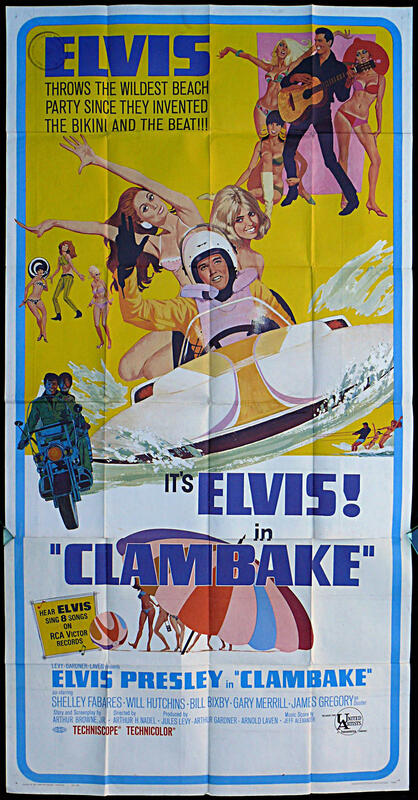 Poster of Elvis Presley’s "Clambake," which was partially filmed at the Miami Marine Stadium. “At this time in history, the 1960s, as Miami was becoming the world center for this sport, we had no place that was appropriate for the sport, and racers were getting hurt,” said Lowinger. Apparently, boaters would run into coconuts and other debris in the open water which, according to Lowinger, can be dangerous at high speeds. The stadium is also a feat of design and engineering. When it opened, the stadium’s roof was the longest piece of cantilevered concrete in the world, stretching as far as a football field over the grandstand. Designed by a young, Cuban immigrant, Hilario Candela, Lowinger feels the stadium reflects the Miami story in more ways than one. “Miami and the Marine stadium have lived the same life—misguided management, abandonment and emergence of an art culture,” said Lowinger. The stadium has been shuttered since Hurricane Andrew in 1992, which made it fertile ground for Miami’s budding graffiti and street art movement. In honor of the stadium’s most recent life, the exhibit does include original graffiti art alongside archival photographs and a speed boat. Concrete Paradise: Miami Marine Stadium opens Oct. 17 at the Coral Gables Museum and runs through January 5. Advocates for the Miami Marine Stadium have received what they say will be a decisive moment in the effort to renovate and expand the stadium. The Miami City Commission has approved a unanimous recommendation from a citizens steering committee, asking that the city designate the needed area surrounding the stadium for a future park's use. Lands are to be under the control of Friends of the Miami Marine Stadium, a group whose sole purpose is to renovate the dilapidated stadium, which has been closed since Hurricane Andrew in 1992. One of Miami's leading theaters was shuttered in 2006, but an effort to revive the Coconut Grove Playhouse has now cleared an important hurdle with the state. On Tuesday, Gov. Rick Scott and his cabinet approved a plan from Miami-Dade County and Florida International University to rebuild and reopen the historic Miami theater pending resolution of some outstanding financial debts and claims on the property. The county's Cultural Affairs Director Michael Spring addressed the Cabinet during a meeting at Miami-Dade College Wolfson Campus. When you think of architecture in South Florida, the first styles which come to mind might be Spanish Revival or Art Deco. Moorish Revival probably doesn't top that list -- unless you're familiar with Opa-locka. In 1976, South Beach's population was aging and so were the buildings. "I'll take care of the buildings. I'll do the frosting on the cake because these look like they're going to be a lot of fun to play with," said Horowitz in a film from 1988 called "Pastel Paradise." His love for Art Deco is why South Beach looks the way it does today. Horowitz came from New York -- where he designed furniture, did window dressings for Bloomingdale’s and studied architecture.